Earlier today I wondered what Ron Suskind's forthcoming book, Confidence Men: Wall Street, Washington, and the Education of a President, would have to say about White House chief of staff (and scapegoat du jour) Bill Daley. One thing it says, I have since learned, is that in September 2008, as polls were starting to show that Obama was the likely winner, a meeting was called with three former Clinton chiefs of staff: John Podesta (who would later be Obama's transition chief), Leon Panetta (now defense secretary) and Erskine Bowles (later co-chairman, with former Sen. Alan Simpson, R.-Wy., of Obama's deficit commission). 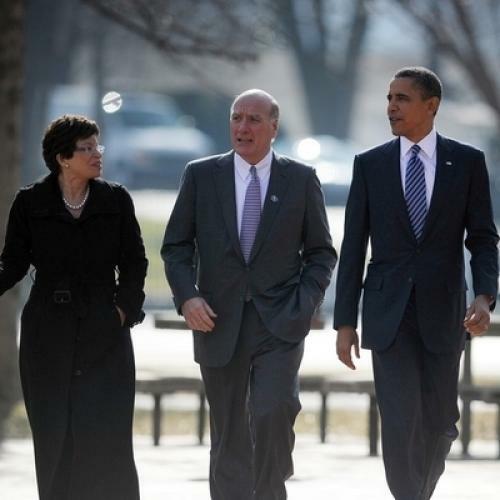 Obama was there, along with a trio of Chicagoans--Valerie Jarrett (now senior White House adviser), David Axelrod (until recently a White House senior adviser, now dispatched to prepare the 2012 campaign), and Daley, who was then an executive at JP Morgan Chase. Also present was Pete Rouse, a non-Chicagoan but an Obama insider who served as his Senate chief of staff; Rouse would subsequently serve temporarily as White House chief of staff after the departure of Rahm Emanuel (another Chicagoan, not present at the meeting). Obama asked the former top Clinton aides for advice about what to do if he became president. Bowles immediately answered: "Leave your friends at home. They just create problems when you get to Washington." The other two former chiefs of staff nodded in agreement. Axelrod and Jarrett, Suskind writes, "looked on, dumbfounded." Suskind doesn't describe what reaction, if any, Daley had to this declaration. According to Suskind, after Panetta and Bowles talked awhile about the qualities Obama would need in a chief of staff, Obama cut them off and said, "Sounds like you're talking about Rouse" (who before working for Obama was chief of staff to Sen. Tom Daschle, D.-South Dakota and Senate Democratic leader, defeated in 2004). Rouse begged off for personal reasons. The group then proceeded to discuss other names for chief of staff. According to Suskind, Emanuel's name never came up. The point of the story is that Obama did not follow the former Clinton chiefs' advice. He brought Axelrod and Jarrett to the White House, made Emanuel chief of staff, and eventually replaced Emanuel with Daley. The rap against Obama's White House management style became that he was too dependent on old friends and fellow Chicagoans. Whether the debt ceiling negotiations would have gone better had Obama followed the three Clinton chiefs' advice and hired an old Washington hand--hiring old Washington hands is pretty much what old Washington hands always advise--is anybody's guess. I don't know whether Suskind's book has anything more about Daley; this anecdote is about Daley only indirectly. Further details will have to await release of Suskind's book on Tuesday, or additional pre-publication press leaks.